Kroepoek is one of the random snacks that I had while I was over in the Netherlands. I even brought a bag back on the last trip. Like most snacks, it boasts that it is made with zonnebloemolie (sunflower oil). It’s traditionally an Asian snack from Indonesia and other countries. Since the Netherlands had a foothold in this country for a long time, they took some of the Indonesian culture back to their home country. I first had kroepoek at Marco’s mother’s house. I then asked Marco what the heck it was, and he graciously got me more at Albert Heijn. It’s definitely one of the snacks I look forward to having again. I think the beer I sampled was Hoegaarden. Kroepoek! Lekker! Definitely one of my favourite food finds since moving here. Hoegaarden was the beer we drank frequently when we first moved here. I can’t remember why we stopped. I tried it a few times. Mainly I just don’t drink that much beer. The only beer I will always drink is bud light lime (went down easy), or one that I only found on tap once: Sam Adams cherry wheat. I had it on tap (divine) at the NY Ren Faire two years back in Tuxedo. When you go to a chinese take out, they always ask if you want kroepoek. It tastes great, I agree! Love to read your blog causin! You should become a writer one day! When I was younger I wanted to be a writer (focused on English studies and dabbled in writing on the side) but nothing ever came of that. It’s still weird to come across my high school/college writing every few years. I love these snacks too. 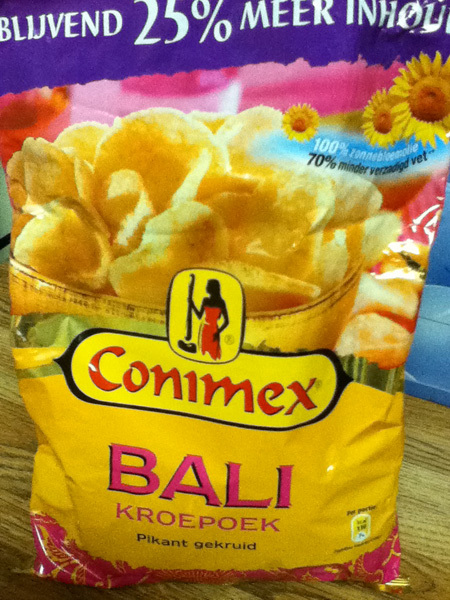 My grandfather was Indonesian/ Dutch and used to serve these with dinner. They are such a treat. A Vietnamese restaurant near our home in California also serves them. Sounds like an international snack. Thanks for sharing. Can’t wait to eat them again in Amsterdam! I was able to find them in Albert Heijn, so you won’t have to search that hard for them at least!